At Goldline, we know the importance that driving controls can have on your independence. This is why our London, Ontario location offers many different types of driving controls that can be specially fitted to your vehicle. Once a Driver Rehabilitation Specialist has evaluated your specific requirements, we can outfit your vehicle with the controls for your specific needs. The standard type of mechanical hand controls usually consists of a “push-pull” or “push-rock” system that allows for left-hand operation of your vehicle. There are many different variations of this type of hand control, which could include right-angle or right-hand operated applications. Depending on their abilities, some drivers might require more advanced controls for their mobility vehicles. At Goldline, we offer many styles of these devices which can assist you with steering, braking, transmission shifting and more. To make driving even more convenient for you, Goldline offers different features that can be operated with auxiliary switches and other devices. This includes things like turn signals, wiper control, cruise control, power windows and more. Please contact us so that our experts can help determine which features are available for your vehicle and requirements. Commonly known as spinner knobs, these devices are often used along with mechanical hand controls when installed in your vehicle. Spinner knobs are mounted to the steering wheel with a quick-release type of bracket. They are available in different colours and shapes. Tri-pin and Palm Grip styles can also be provided, depending on your needs. Low effort and zero effort steering is also available for many makes and models of vehicles. When the right foot cannot be used to operate your vehicle, a quick-release Left Foot Gas Pedal device may be prescribed. 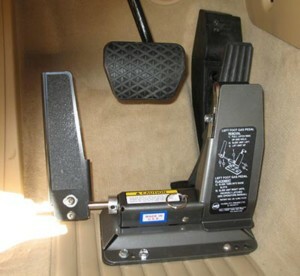 This pedal can easily be removed for other drivers when needed. If you’d like to learn more about adaptive driving controls and their availability for your vehicle, please contact us. If you are not already qualified, you will require an assessment with a Certified Driver Rehabilitation Specialist (CDRS) or an Occupational Therapist (OT) with advanced specialty training in assessing driving skills and providing driver rehabilitation before you purchase and install adaptive equipment.